Think about when Robert Frank's images were made. What was their meaning then? How does their meaning change today? Try to spend some time exploring other parts of the museum. How does this space and collection differ/compare to other venues we've visited this semester? Submitted by srogal on Fri, 2009-10-09 12:47. I have been to the Metropolitan museum of Art many times since starting school in New York. Even before I moved here, when I would just visit New York as a kid, it was always a place that I would go to with my family. The Met is one of New York City’s great landmarks and one of the best museums in the world. Upon entering the met you can already tell that this is a special place. There is art from all around the world and the museum contains some of the most beautiful artwork around. The exhibit “Looking In: Robert Frank’s The Americans” is a collections of photographs that showcases his work from the book “The Americans” which is celebrating its fiftieth anniversary this year. All the work is in black and white which gives it a very old timey feel and considering the fact that all of the photos were taken almost 50 years ago they feel old timey on their own. They seem to feature simple bits and pieces of American life. The photos are little tiny moments that, when put all together make up the fifties in America. The most striking images are the ones that are of people. The way people dressed and appeared back then is very interesting to see. Some of the photos also seem to be hinting at some of the racial issues that were hot topics of the time. Overall the exhibit was very moving and striking. Submitted by pkirsch on Sat, 2009-10-10 12:36. The met is known for many things; although, its most recent claim to fame is the lunch table for “Manhattans Elite” aka the social hierarchy of Gossip Girl. Sadly I did not see Blair or Serena on the met steps. Although, I did see tourist from all over the world flock into the museum to experience a metropolitan afternoon. The museum itself is huge, and one can easily get lost, and trust me I did! It took me four security guards to find my way to one of the most exquisite photography exhibits I have ever seen! Bravo Robert Frank, your work is fabulous! As a student of photography I was able to appreciate Robert’s work on many levels. My favorite aspect of his exhibit was his ability to use photography as a historical document. The first photograph that caught my eye was a picture of people on a bus; the whites were in the front, and the blacks were in the back. This photograph was important to include, as I was immediately aware of the time period that these photographs were taken. Something else I found interesting was the juxtaposition Frank used, when he matted two photographs together. For example, the photograph of the American Flag represented that all men are created equal, but then that picture was paired with a photograph depicting racism—in turn making each image more powerful. At the end of the exhibit I was reading about Frank, and came across an interesting paragraph, Frank was discussing public and private memory. These pictures allowed me, as the viewer to have an intimate private experience with each subject and to imagine how they were feeling. These photographs are portals to the past, although each photograph still posse’s relevance today. Many people still face oppression, and racism, therefore Franks exhibit is appropriate, and current. Submitted by meghanrose on Sun, 2009-10-11 20:36. This was not my first visit to the Metropolitan Museum of Art, but it has been awhile since I have been inside the museum. The museum is so large it gets confusing but the diverse amounts of art there are makes up for it. Compared to the past museums I went to this semester this had a very different feel of classical art even with the many modern sections there were. I enjoyed that regardless of how many times I have been to the Met I seem to find a new and different area every time. The location of this museum is also another reason why I enjoy it so much. The steps of the museum along with 5th Avenue outside central park are some of my favorite places in the city. This atmosphere around the Met contributes to is feel as a museum. The Robert Frank exhibit was by far one of the most popular exhibits I had been to all day. His photography was very real and he tried to show the truth. When these came out in 1959 it was very controversial for its content and its composition. His photography seemed to be very modern, I feel like you could go see work that could relate to his from an upcoming photographer today. His idea of showing the real life struggles of an everyday person was something everyone could relate to. “…But maybe nothing is really true, except what’s out there and what’s out there is constantly changing”, quote from Robert Frank. This constantly changing world still has people relating back to the same feelings of depression, love and joy. His photography captured the time period and these feeling that are constant. Submitted by afrazer on Mon, 2009-10-12 18:21. I have always been very interested in photography. To me it is the most beautiful and creative way to capture a moment. Photography is very raw, it does not leave out any details and it allows artists to have their own artistic input on every day events. Robert Frank’s photographs all seemed to capture the main theme of his time, romance. There were a couple of pictures that caught my eye in particular. There is one photograph titled “Tulip” that shows a man in public holding a tulip behind his back. This picture has a very mysterious feeling to it. Viewers must ask: Why is he carrying that flower? Why is it hidden behind his back? Who is it for? This was one of my favorite pictures because it has a romantic feeling to it. I feel that during that time it was pretty ordinary to see a man carrying a flower. It was some what a custom to give women flowers. In present day it is a surprise to see a man make a romantic gesture like that. 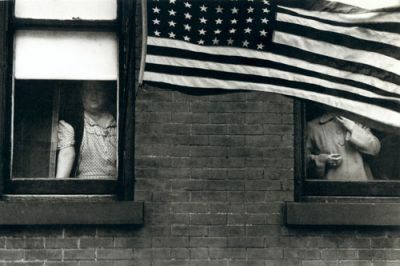 In Robert Frank’s time I believe this photograph would represent an every day situation. But in present day I believe this photograph would represent something rare and unordinary. There was another photograph that caught my attention immediately, it was actually a series of photographs of an old couple. It shows this couple sitting on a bench together, then it shows them walking away together. The couple is shown hugging and embracing in all of the photographs. In Robert Frank’s time I believe this represented how common marriage and faithfulness was. In present day I believe these pictures would represent how rare true love is and how it is next to impossible to have a long healthy marriage. In the end Robert Frank’s photographs show what used to be common in that time, are considered extremely rare now. These photographs have shown me how there is so much more to life than just school and money. They also emphasize that we need to focus more on love and self enjoyment sometimes than just continuously working. Submitted by vgeager on Mon, 2009-10-12 20:24. Robert Frank’s “The Americans” exhibit was very intriquing. Although the photographs were taken in the 1950’s, they were still relevant to todays social and political issues. Frank traveled around the United States at a time when it was best to hide every problem under the facade of the “all-american” 1950’s family. However, Frank delved deeper into society, and photographed the true United States in all its glory and hate. Each photograph told a different story and had a different impact of Frank’s book, which was published in 1958. Each photograph depicted a different side of the United Sates during a turbulent time. Two of the most striking photographs in the entire exhibits were very obscure, yet very interesting. The first, entitled “5 avenue” depicted a road in Texas, with a giant neon sing that said “5 avenue.” When most people think of “5 avenue,” they think of New York City, and all the designer shopping one could do. However, in this photograph the street was empty and depicted a dirt road. Frank was being ironic. The normal thinking of “5 avenue” is one with designer stores and hundreds of people rushing to go about their everyday lives. However, this this photograph the complete oppasite was shown. The second photograph was of a man, standing on a ledge during a protest in Chicago. The image was raw and showed the emotion the man was feeling during the protest. The image was extremly powerful, and definitly showed the viewer what really went on during the 1950’s in the United States. Compare to the other venues I have been to this semester, the MET was definitly my favorite. It houses so many other interesting exhibits that cover a wide variety of subject matters. Although I did not get to all the exhibits I wanted to see, the few that I did visit were amazing. The MET is truely an amazing museum, and defintily a place I would visit over and over again. Submitted by callard on Mon, 2009-10-12 20:28. As a first time visitor of The Metropolitan Museum of Art, the architecture of the building instantly took my breath away. After getting my ticket, I ventured up the echoing stairs to Robert Frank’s exhibit, “The Americans.” Robert Frank’s work inspired me. His ability to capture the essence of each American culture with the snap of a shutter was baffling. Much of his work surrounded racism during the time period. His idea to use an American flag in many of his pictures was revolutionary. It is as if he was saying, “Look what America is,” but without having to use words. He was ahead of his time, knowing that America had to change, and his work reflected his political and social views on the subject. I think the meaning behind his pictures is even more powerful today. We are struck by the idea that there actually was a time when racism in America was as bad as it was during Robert Frank’s time period. The exhibit made me wonder how he took these photographs. Did he just stand in certain places and wait for something interesting to happen? That’s the thing, he wasn’t looking for anything interesting - just real, raw moments in life, and they turned out to be interesting because he gave them his artistic touch. I think a true photographer is someone who needs nothing more than a camera to take an amazing picture - and to derive emotion from that picture defines an artist. Robert Frank was someone who I had never heard of before taking this trip to the Met, and now I left with a newfound appreciation and respect for him and his work. Upon exploring some of the other exhibits in the museum, such as the Egyptian and Medieval exhibits, I found the Met to be an extremely diverse museum. In comparison to the other museums and libraries we have visited this semester, I have to say that I think the Metropolitan Museum of Art was the biggest and most extravagant so far! Excellence is the key word. Submitted by cidnichols on Mon, 2009-10-12 21:08. Excellence is the key word. The photos were very striking. It seems that the photos were taken during the 50’s. The 50’s is such an interesting era because it was the time when civil rights began to come headstrong. It was quite evident that racism was very much present in Mr.Franks photography. It also appears to me that Mr.Frank captured moments in everyday life. There was one portrait “Elevator-Miami Beach”. The girl appears to be the bellhop and she seems to be a little tired. That can be due to going up and down and letting people in and out for however long she has been doing it. The lady coming out of the elevator seems to have on a fur shawl. That normally shows that someone is rich. Also, there is a portrait of people on a train. The Caucasians were in the front and the African Americans were in the back. A clear sign of racism in the 1950’s. I really enjoyed his photography because the photos were simple. You can easily relate them to everyday life. Submitted by bmfwcc on Mon, 2009-10-12 21:21. I was very excited to go to the Met. I hadn’t been there since I was a little. All I had remembered of it was the awesome Egypt exhibit so I was excited to see that again. As soon as I got there I headed to the Robert Frank exhibit. I really enjoyed the exhibit. Photography has always been a big hobby of mine, especially black and white photography, so it made this exhibit extremely intriguing. I find black and white photography to be very raw which is where I find the appeal in it. I was somewhat familiar of Robert Frank and his work. It was very cool because the photos are from over 50 years ago so it was interesting to compare the way photography has come along since today. It was also interesting to see the depiction of “the american life” during those times through photography. I liked how all of the different pictures showed different aspects of America. My favorite was titled U.S. 285, New Mexico. This was a photo of a road going of into the distance. I loved it because the angle in which the photo was taken just made the picture and the road looked like it went on forever. I’ve always found it amazing how taking a photo from a different perspective can completely change the picture. Overall I really enjoyed the exhibit. It gave me an excuse to go back to a place where I had great childhood memories. Submitted by Erin Campagnola on Mon, 2009-10-12 22:07. Before I went to the Metropolitan Museum of Art I heard it was an amazing place and a must go to. When I found out this was are next exhibit I was so excited to see what the fuss was about and could not wait to get there. The exhibit by Robert Frank had a very honest feeling to them. They were real people with real emotions and it really truly captured what life was like in the 50’s. One major theme I saw in his photographs was opposition. He would have a symbolic piece like the American Flag or Santa Clause in the shot with a down and out looking person as the main focus. Some of the pictures had to do with the segregation factor of the 1950’s and some had to do with horrible living or working environments experienced during that time. The picture that interested me the most was The Trolley because I thought it was ironic that both black and white passengers had depressed and lifeless expressions on their faces even though it was thought that whites had a better life than blacks during that time. The Metropolitan building itself is a massive and intimidating when your walking up the steps. Inside it kind of feels like Grand Central Station when you walk in and you can’t help but be overwhelmed. It’s very touristy and definitely can’t be fully experienced in one day because of the amount of art work house in the Met. I would consider it the mecca of museums in the United States and I am going back in the near future to explore more parts of it. Submitted by obahar on Mon, 2009-10-12 22:32. You can see that the Metropolitan Museum of Art is quite a place even before entering the building because of its beautiful architecture. After entering the museum I was shocked at how big it was. I didn’t expect there to be so much space and so many people at the museum. Unlike most of the exhibitions at the other museums, there was artwork from around the world. It shows the evolution of art with art from different civilizations and different styles of art. Studying about the World Wars was something I always enjoyed throughout High School. When studying about the wars, we always discussed the other nations in more detail and post World War II life in Europe. We never really discussed life in the United States, which is why this museum was one that I looked forward to visiting more than the others. The photos themselves are in black and white showed that they were taken many years ago. Just by looking at these pictures, you can see that there was a difference between life back then and now, especially with the way people dressed in the past. My interpretation of the photos was that life was not quite as busy back in the fifties. Like Erin, I thought the Trolley was the most interesting. It was the most interesting to me because it most clearly and effectively showed the segregation with the blacks sitting in the back and the whites sitting in the front. I immediately thought about the stories of Rosa Parks and visiting the Black Panthers exhibition because those pictures show how far the United States has come today with trying to create equality and fair rights for all. Submitted by sjones on Mon, 2009-10-12 22:33. I always love going to the Met. The immense building is so beautiful, although it is always overly crowded with tourists from all over the world. I feel like i could spen days and days in the Met and I wouldn’t be able to observe and apreciate all the great works of art housed in the museum. I got lost on the way to the Robert Frank exhibit, however it was a blessing in disguise because I stumbled upon several amazing exhibits. At one point I actually found myself in a Japanese garden designed to display the art of Feng Shui. When I finally made my way to the Robert Frost exhibit I was amazed at the power of his photographs. Each image depicts an everyday object, person, event, etc, but Robert Frank manages to capture so much emotion in each image. He captured the emotions of everyday American people in beautifull and moving photographs. My favorite photograph from the collection was #4. It was an image of three men at a funeral. The photograph had such a profound feeling of sadness. Robert Frank captured the expression on the men’s faces so perfectly, the veiwer felt as though they were experiencing the same emotions. I also loved the final image from the collection which was a picture of the photographer’s wife and son in a car. The picture was taken while the family was traveling across the country so that Robert Frank could pursue his photography. This image captured the feeling of sacrifice that the family went through for Robert Frank’s work. My favorite aspect of Robert Frank’s photography is that all the pictures are black and white. I feel like this enhances the image. I think that black and white images make it easeir to see what is right in front of you. Submitted by Karlikopp on Mon, 2009-10-12 23:41. Before going the Robert Frank gallery I did a little reading to get a bit of history on the artist. I discovered that when “The Americans” photo book was first published it did not gain immediate popularity and at first suffered some criticism. This was apparently because at the time of its release Frank’s style of photography deviated from popular techniques at the time. After visiting the exhibit I was shocked that it did take a while for the book to come into the mainstream and gain wider respect. The themes that corresponded with the collection of images were very candid portraits of society and culture of the mid-1950’s. The concept of racism in America was documented in the images, along with social class separation, and religion in America. Even though during the time the civil rights movements was picking up momentum, many of theme stated in his photography are still present in modern America. Different social classes continue to exists and are discriminated against along with different races and sexes. Also, browsing through the collection I thought about our previous reading assignment and the article that discussed the importance of a caption on a photo. The captions at the Robert Frank gallery really provided a lot of meaning that would have been lost or otherwise gone unnoticed. Just the simple caption of the photographs location provided a lot more understanding of the ideas being expressed by they artist. Compared to the other museums I have visited the MET has one of the most extensive collections of art and draws a large crowd. Despite the crowds I find it wonderful. Submitted by mcasas on Tue, 2009-10-13 10:30. I was blown away by this exhibit to say the least. I absolutely love black and white photographs, and to see his perspective in the 83 images was very moving and inspiring. After I viewed the exhibition, I came to understand just how he changed the course of 20th century photography at the time, since it wasn’t taken seriously. The hobby of photography has consumed a few years of my life now and I feel so privileged that I had the chance to see Robert Frank’s work. The people he captured in these pictures looked so real and raw with emotion, and each picture told its own story. Frank’s pictures depicted racial issues, religion, politics, economic disparity and even couples in love. They all have an underlying meaning that made me want to analyze the photo and all of its details. I found it interesting how Frank utilized the positioning of the people with the lighting. The meaning of the pictures changes today since the American culture has revolutionized, although some of the themes are still relevant. The 1950’s always seemed like an intriguing decade and I truly enjoyed this exhibit. Aside from Robert Frank’s “The Americans,” I enjoyed viewing the artifacts and works of art from all over the world. This space differs from the other venues we’ve visited since it is much more vast and historic. Compared to the others we’ve seen, this particular exhibit of photography gave off a more real, wordless and motionless feel since it portrays such reality at the time. Submitted by Lauren Borkowski on Tue, 2009-10-13 13:01. Robert Frank was one of the first photographers I studied when I began learning how to take pictures - and I still vividly remember leafing through “The Americans” during the first day of Intro to Photography. I came into this exhibit extremely eager to see his work for myself, and the prospect of being able to look at Frank’s photographs when they were among the first I had studied as a photography student was very exciting to me. The overt meaning in Frank’s work is very clear, as he captures iconic moments of Americana in a way that most people can easily understand and make sense of. However, it’s the message behind the image that really resonates in Frank’s work. “The Americans” was shot during the Cold War Era - and because of that, the patriotic images take on an entirely different meaning. For example, “Parade - Hoboken, New Jersey” (The picture at the top of this blog for those of you who, like me, have a bad memory) has a chilling covert message behind it. The most important aspect to keep in mind when looking at Frank’s work is the level of fear and uncertainty during the 1950’s and The Cold War. People constantly lived in fear of a nuclear war with the Soviet Union, and students were taught how to hide under their desks in case of an attack. The fear was palpable and real to Americans during that time, and therefore images like Frank’s which depicted American symbolism held a special kind of tension. In “Parade”, you can almost feel the undertone of fear of the people in their apartment windows. This unspoken meaning is something that I think Robert Frank is a master of, and I was very happy to attend this exhibit at the Met. Submitted by h_Duran on Tue, 2009-10-13 12:37. This was my first time at the Metropolitan Museum in a very long time. I am still always intrigued by the statues and art there so going there on assignment is a treat rather than a chore. This Exhibit proved the saying a picture says a thousand words. I really enjoyed Robert Frank’s “The Americans” because its basically a huge photo album for America. Each picture was so simple but had such depth. My favorite picture was of a black woman holding a white baby, it was probably the baby’s nanny but it was beautiful. I also like all the rough drafts and journal entries displayed, they added more realism to his art. I noticed that he traveled all over to take pictures and that made it interesting. The exhibit was a bit crowded when i went but everyone else there were very astonished by everything. I even tried to listen to the tour guide but I walked in the middle and wasn’t sure what he was talking about.I guess their meaning back then was to show the differences in different parts of the country, and how everyone was going through something different. While today we can see it as how different everything was back then. This museum was different from the others because it had art from almost every time period, artist and it was just plain beautiful. Submitted by gkeefe on Tue, 2009-10-13 13:42. It has been eight years since the last time I have been to the Metropolitan Museum of Art. I recall the museum being huge and myself being afraid to touch anything because it reminded me of my great-aunt Nancy’s house, which looks like a museum, and my mother always told me I wasn’t allowed to touch anything when we went there to visit her. Anyways, I had to venture through the whole thing and save Robert Frank’s “The American’s” exhibit for last. I must say I am glad I did save his exhibit for last because it was absolutely breathtaking. The exhibit was all beautiful black and white photographs from the 1950’s that ranged from people sitting in cars to red carpet Hollywood movie premieres. I have always been a fan of simplistic black and white prints. I think they are very sophisticated looking, but at the same time show a deeper meaning to something besides just being a pretty picture. With each print, I wanted to dive into that picture and live in it for a moment to truly understand the meaning of it. I felt as though with this exhibit one couldnt just move from print to print. You really had to take some time with each picture because each one was a different story about something during that era (1950’s). It is very interesting to see this exhibit because it is a unique form of communication using photographs from years ago and seeing the parallel differences and similarities between them using the time then compared and contrasted with our current situations in the world today. Many people today take photography for granted. Everyone is always taking endless amount of the same pictures that dont really show meaning to anyone but themselves and adding them to facebook. This includes me unfortunately. But after seeing this exhibit it makes me want to better appreciate the art of photography due to how beautiful some artists really see things. And when they capture these things and are able to share them with the world for generations, it truly inspires. Submitted by Kimberly Durand on Tue, 2009-10-13 14:09. Submitted by Caroline Evans ... on Tue, 2009-10-13 15:10. The last time I was at the Met, I was in seventh grade and was, for the most part, extremely bored for the duration of the visit and busied myself by running through the Egyptian art exhibit and was as a result reprimanded by a few different figures of authority. I figured this time I would try to take advantage of it a little more. I really enjoyed the photographs by Frank. I think they really touched on American culture at the time in a way that family photographs or posed works couldn’t. The photographs really are fragments of time. In some of the photos, it doesn’t even look as though the subjects are aware their photos are being taken. In the same way the theater can allow a 4th wall to stand or break it down, these photographs are successfully ignoring any kind of a wall, because they are taken in such a manner which denies it’s existence in the first place. They are raw and beautiful, taking simple moments from the lives of these every day people and turning them into history. Unlike posed photography or family photographs which are most often used to document the lifestyles and culture of a time period or generation, these photographs are taken with no bias and as a result give the viewer a real understanding and feel for what the time period was like. Submitted by davin.byrne on Tue, 2009-10-13 15:45. I love the MET, it’s one of my favorite places in the city to get lost in plus it’s location right next to Cedar Hill makes it my prime territory in the summer. This visit to the MET did not start well as I, upon entering, almost slit my finger off with the MET pin! Robert Frank’s “The Americans” exhibit is celebrating it’s 50th anniversary, though in 2008 France celebrated it’s 50th anniversary of this piece. “The Americans” came out one year earlier in France. Overall the work Frank did changed the course of photography and helped America see itself more clearly. Through 83 photographs Robert Frank disected American life to more blatantly show people “plagued by racism, ill-served by their politicians, and rendered numb by a rapidly expanding consumer culture”, his words of describing his exhibit are much better than mine would ever be. As I walked through his collection I found that Frank did an amazing job in showing the America that has always been behind closed doors, hidden behind walls, locked away from the central stage of media. His gallery was magnificent in the way that he made his artform speak without even using words. His quote, which was placed above some of his pictures truly helped the viewer understand why he pursued his subject so broadly yet clearly. Basically I loved this exhibit and hope to revisit it asap. Submitted by delisig on Tue, 2009-10-13 16:02. The Robert Frank’s exhibit went along with the theme from the video diaries we saw last week, with the idea of being a mirror. Frank wanted to show the country as it really was, without any poses or sets, he just wanted to capture a true American moment. His exhibit intrigued me with its small details that could go easily unnoticed but defined the message of the picture. For instance the army recruiting office, all pictures of those offices have smiling recruiters sitting tall behind their desks. But Frank chose to take a picture of the recruiting office just from the door way and in the corner you could see the feet of the officer resting on top of his desk. I admire the way he chose to take his pictures, without posing people or moving unwanted objects. Frank gives a different kind of view into what America was during its times of war and poverty. The Metropolitan Museum of Art is massive compared to the Brooklyn Museum, and the Morgan Museum. But the amount of people shuffling in and out of the exhibits and rooms would make most believe that it is crowded and stuffy when its actually spacious and relaxing. I went on Monday, the day of the Italian American Heritage Parade, which made it all that more interesting. As I walked along Central Park I got to watch marching band after marching band perform and strange Italian people say strange Italian things. And while at the museum I saw people in their parade costumes exploring the museum, and taking in a New York treasure. Submitted by oalagiozidou on Tue, 2009-10-13 16:40.